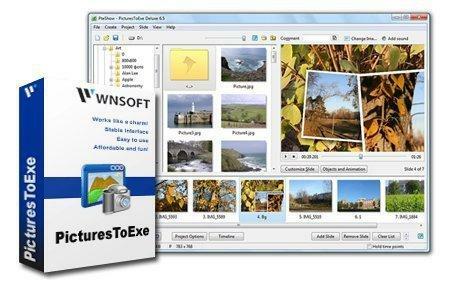 PicturesToExe creates slide show in stand-alone EXE file. Using a clean-looking, intuitive interface, you select pictures from any combination of folders on your system. Then press the Create button. In just moments, you've produced an .exe file that, when run, displays the images with the options you've selected. Options let you specify automatic or manual sequencing, pick the timer interval, adjust font and background properties, and decide whether you want the sequence to run once and terminate or to repeat continuously.